Gregory Spencer, professor of communications at Westmont College in Santa Barbara, CA, is a writer I wasn’t familiar with but the title of his book intrigued me. 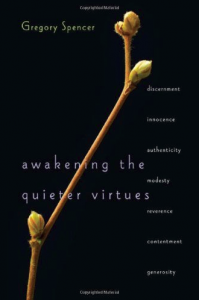 When I glanced at the contents, I knew I wanted to read the book; discernment, innocence, authenticity, modesty, reverence, contentment, and generosity. I thought that Spencer was fairly conservative for a fellow from Southern California and a left of center college. He had good thoughts that kept my attention throughout the book. Except for one thing which is my fault not his. I don’t like the popular style. Spencer teaches communications and obviously knows what style most readers like and he uses it throughout. Chapter one begins with, “I awoke to the sound of gunfire.” Chapter two begins with, “When our three daughters were young.” And so on and so forth. Now when I begin reading that I want to skip ahead a few pages to his point. Most books like this you could read in at least half the time if the author would just give you the information you’re looking for and cut out the stories. But we are in a story mode and Spencer knows it. So reading the same amount of real information takes twice as long. BUT, this book was worth it so I’m glad I took the time. You might like it too. Ben Franklin: “Who is rich? He that is content. Who is that? Nobody.” Gregory Spencer, Awakening the Quieter Virtues, p. 132.